This church contains the tombs of many members of the House of Savoy, including King Victor (King Victor Emmanuel I of Sardinia), his wife, Queen Maria Teresa, and one of their daughters, Princess Marie Adelaide of Savoy. 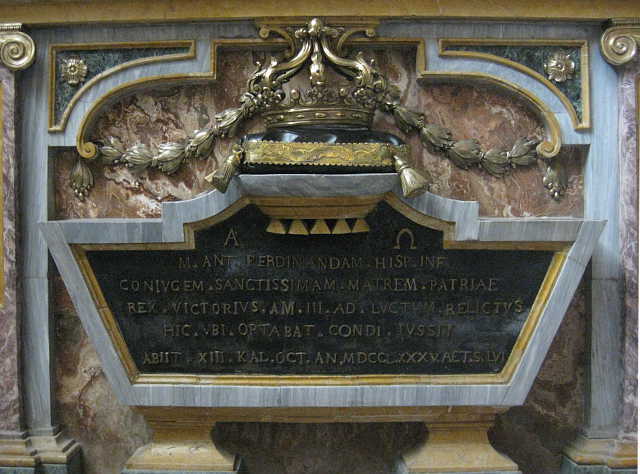 Also here is the tomb of King Victor's great-grandmother, Anne Marie d'Orléans, Queen of Sardinia, granddaughter of King Charles I and heir presumptive to King James III and VIII from 1715 to 1720; it is through her that the succession to the throne passed to the House of Savoy in 1807. 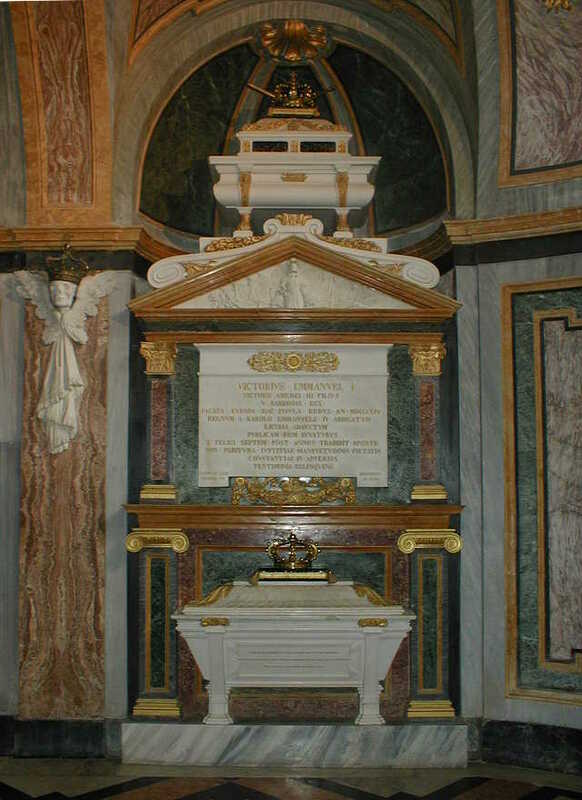 The royal tombs are in the crypt of the church. The guided tour departs from the ticket office and bookstore on the left side of the church. The tour enters the cloister. On the left side of the cloister is the entrance to the crypt. 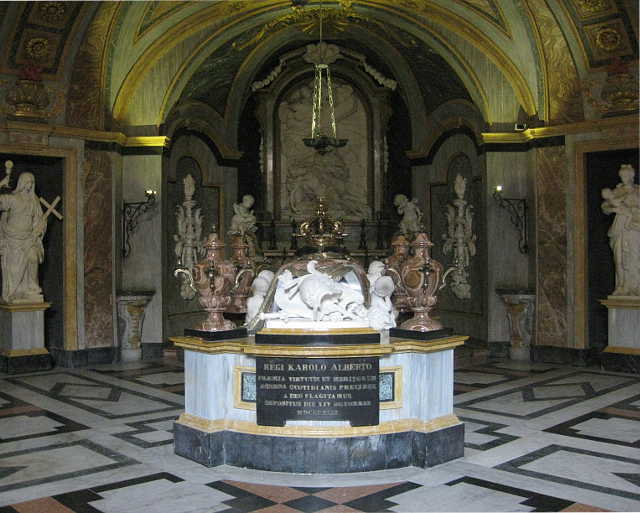 There is a water fountain below a bust of King Umberto I of Italy. To either side is a round bas relief. The tour descends a stairwell, goes along a passage, and then turns right into the nave of the crypt, the walls of which are decorated with variously coloured marbles. REX. SARD. CYPRI. ET HIEROS. M . ANT . FERDINANDAM . HISP . INF . 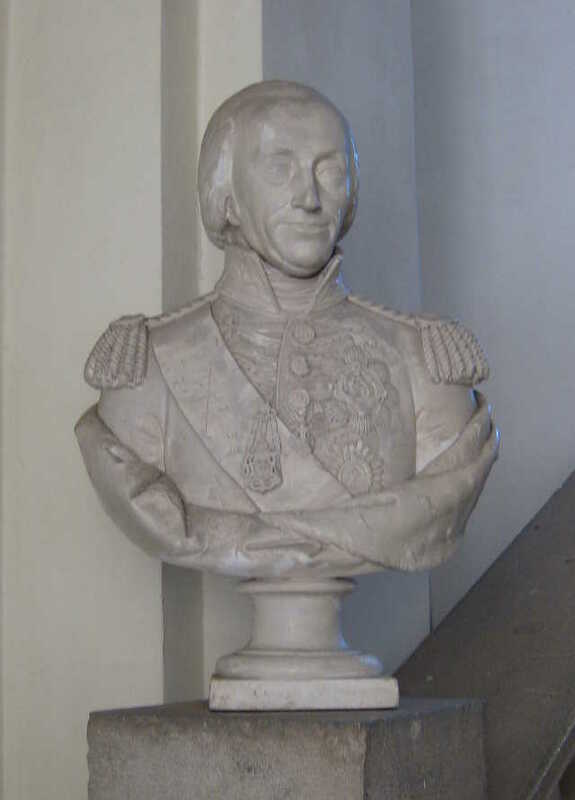 When King Charles Albert of Sardinia died in 1849, his mortal remains were placed in the monument in the centre of the nave and those of King Victor were moved to the right wall of the nave. The tour continues in the left transept of the crypt. At the far end is the tomb of King Victor Amadeus II of Sardinia, husband of Anne Marie d'Orléans. 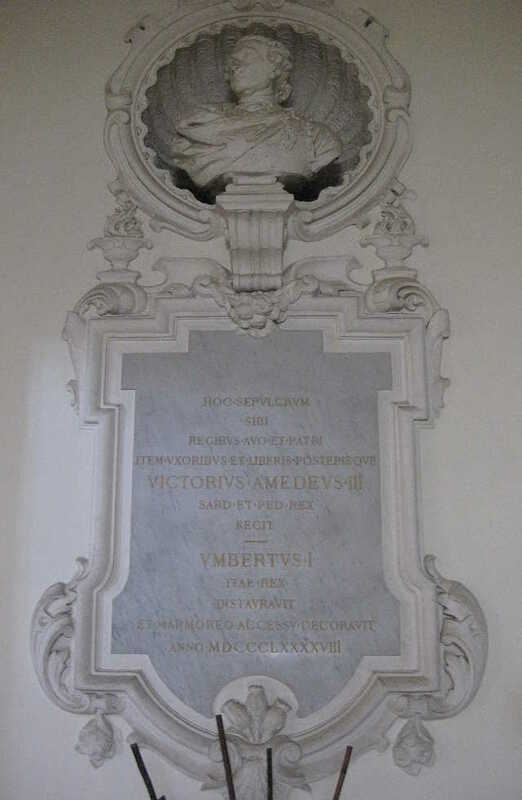 To the right of the tomb of King Victor Amadeus II, at ground level, is the tomb of his wife Anne Marie d'Orléans. The tour returns through the central nave and passes into right transept. At the far end is the tomb of the grandfather of King Charles IV and King Victor - King Charles Emanuel III of Sardinia. 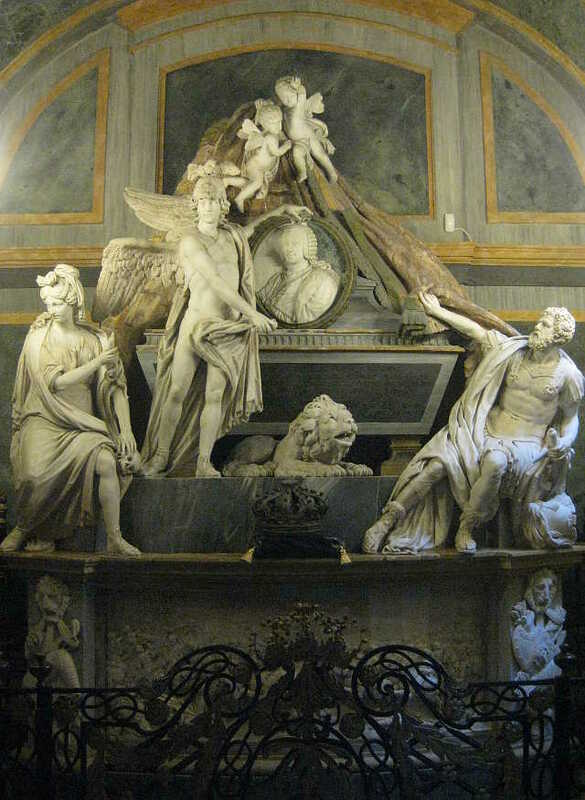 The tomb was designed by Simone Duguet and completed in 1786 with statues sculpted by Ignazio and Filippo Collino.3 Above the sarcophagus is an oval bas-relief portrait of Charles-Emanuel held by the male allegorical figure of "Military Genius" with wings and a helmet. At the left is seated the female allegorical figure "Prudence". At the right is seated the male allegorical figure "Valour". 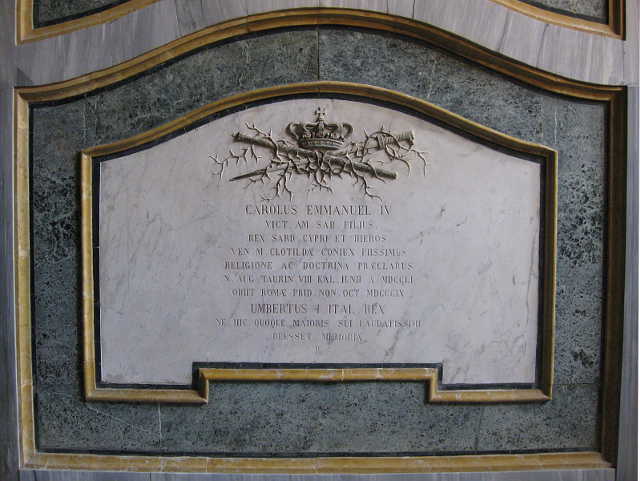 To the left of the tomb of King Charles Emanuel III of Sardinia are the tombs of his three wives. 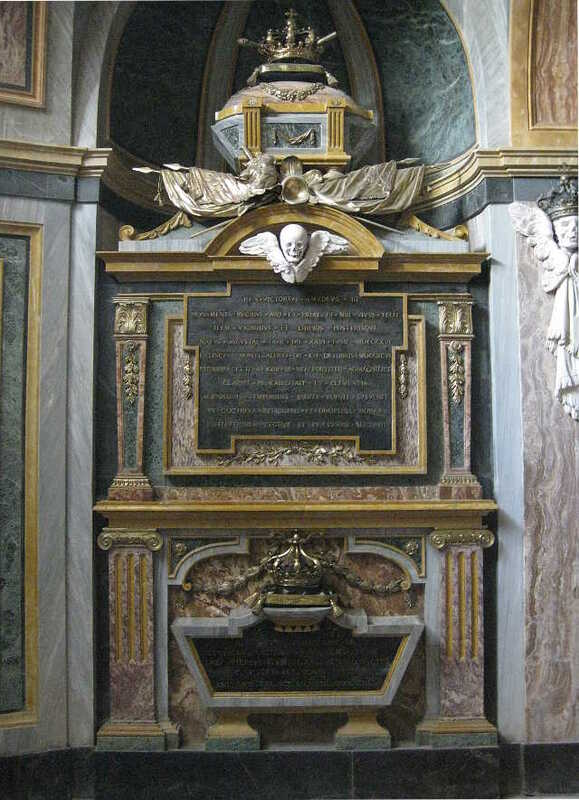 At the top is the tomb of his first wife, Anne Christine Luise, Countess Palatine of Sulzbach (with a prince's crown since she died before her husband became king). 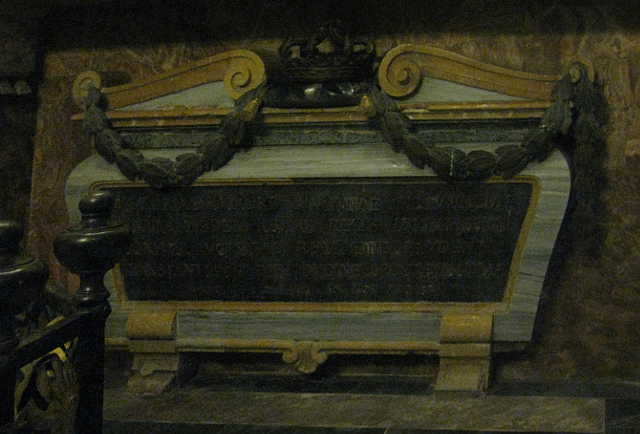 At the bottom is the tomb of his third wife, Polyxena Christina of Hesse-Rotenburg-Rheinfels, grandmother of King Charles IV and King Victor. 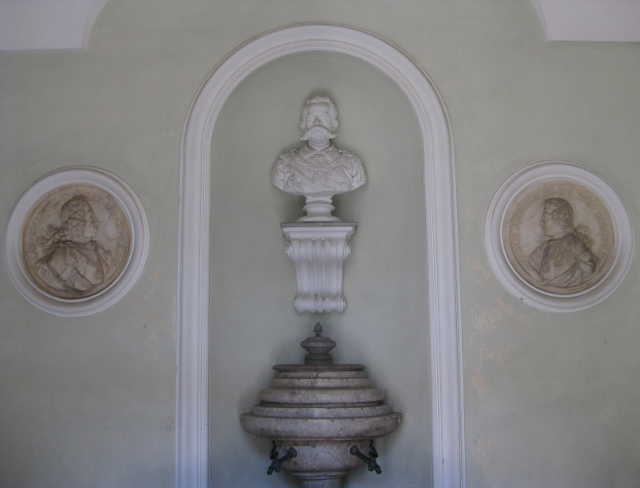 As the tour leaves the crypt and climbs the stairs back to the cloister, one can see a bust and memorial to King Victor Amadeus III of Sardinia. The tour continues in the royal apartment which was used by the Royal Family when they visited the basilica. The main entrance to the apartment (not used by the tour) is a grand staircase with the busts of four Savoys. On the left is a bust of King Victor. Twenty minute guided tours of the royal tombs take place from late March to late September, from 9.30 a.m. to 12.15 p.m. and from 2.30 p.m. to 6.15 p.m.; late September to late March, from 10.00 a.m. to 12.00 noon and from 3.00 p.m. to 5.00 p.m. Closed Fridays, January 1, Easter, June 16 to 30, September 8, and Christmas. 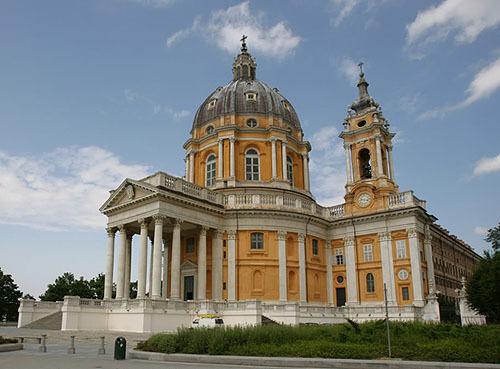 The basilica is located in the Parco Naturale di Superga in the hills to the north-east of the city centre. Take tram 15 to Stazione Sassi, and then bus 79 to Piazza Basilica di Superga. 1 Augusto Telluccini, "La Real Chiesa di Soperga: ricerche storiche e documenti inediti", Miscellanea di Storia Italiana, terza serie, XV (XLVI della raccolta), 116. 3 Ignazio Collino was born in Turin in 1724 and died in the same city in 1793. 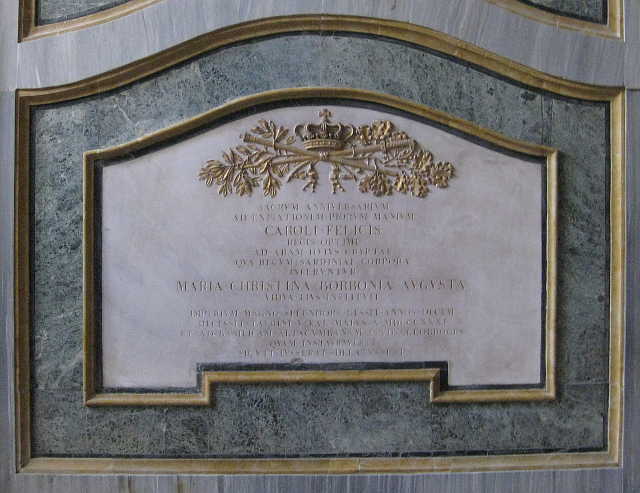 His brother Filippo Collino was born in 1737 and died in Turin in 1800. Image 1 (Basilica di Superga, exterior): http://greatriftvalley.blogspot.com/2007/06/torino.html. Image 2 (Entrance to the crypt): © Noel S. McFerran 2015. 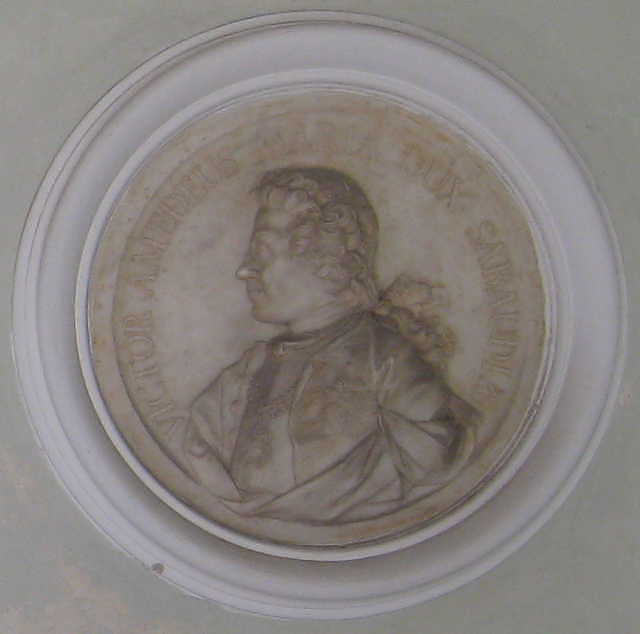 Image 3 (Bas relief of King Charles Emanuel III of Sardinia): © Noel S. McFerran 2015. 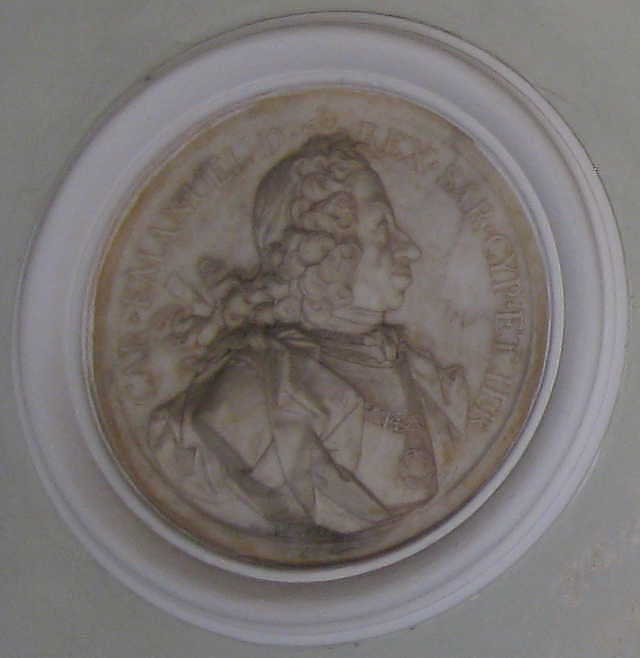 Image 4 (Bas relief of the future King Victor Amadeus III of Sardinia): © Noel S. McFerran 2015. 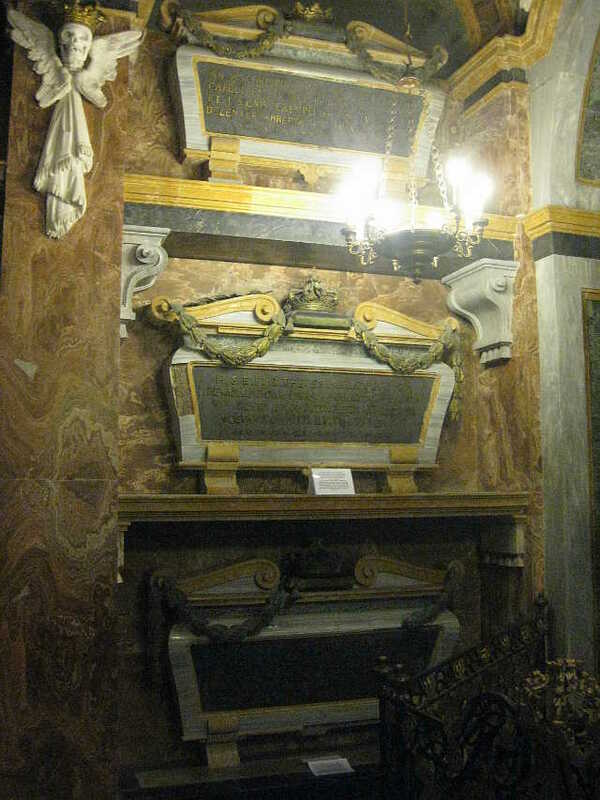 Image 5 (Tombs of King Victor and Queen Maria Theresa): © Noel S. McFerran 2006. Image 6 (Monument to King Charles IV): © Noel S. McFerran 2015. Image 7 (Tomb of King Victor Amadeus III of Sardinia): © Noel S. McFerran 2015. Image 8 (Monument to King Charles Felix of Sardinia): © Noel S. McFerran 2015. Image 9 (Nave of the crypt): © Noel S. McFerran 2015. Image 10 (Tomb of Anne Marie d'Orléans): © Noel S. McFerran 2015. Image 11 (Tomb of King Charles Emanuel III of Sardinia): © Noel S. McFerran 2015. Image 12 (Tombs of the wives of King Charles Emanuel III of Sardinia): © Noel S. McFerran 2015. Image 13 (Bust of King Victor): © Noel S. McFerran 2015. This page is maintained by Noel S. McFerran (noel.mcferran@rogers.com) and was last updated October 9, 2017. © Noel S. McFerran 2003-2017.